I was very impressed when this arrived. I was expecting a simple bag but it has some really well thought out features. It can be attached to nearly anything because it has a clip for thinner things and then a belt buckle hole also. So you can clip it onto an item of clothing or your bag or your belt. Very useful so I have my lens handy to change lens, it's only on my belt! :D Was very impressed and will no doubt buy more! 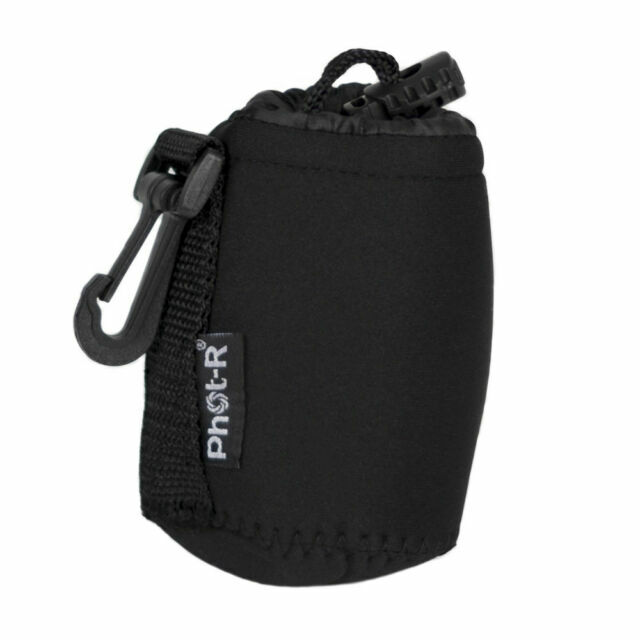 Surprisingly good quality lens bag for very low cost. Small micro four thirds lenses fit ok. Go up in size for larger lenses. Arrived quickly, I was surprised how good the quality is. Although I could have done with a larger size, only just fits the 18-55mm lens I got it for. Works well for keeping my Nikon TC-14E III AF-S Teleconverter protected whilst kicking around in my camera bag.